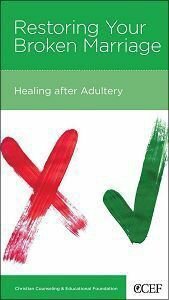 Anger...fear...despair...guilt...shame...when your marriage is broken by adultery, the core struggles of your heart are revealed. But although you and your spouse may be experiencing many of the same emotions, you are standing on opposite sides of a deep abyss--one of you has profoundly hurt the other. Is it possible to bridge the gap between you and heal your marriage? Robert D. Jones offers the hope you need in this honest look at one of life's most difficult experiences. He outlines a detailed, practical process to invite God's presence and power into your marriage. You will learn that God is with you, right in the middle of your broken relationship, and you can depend on him to do what you can't--rebuild trust and renew your marriage. About "Restoring Your Broken Marriage (Christian Counselling & Educational Foundation Series)"